I think I'd love to see a Esoteric Agriculture Opuntia video! Especially anything about growing ficus-indica as an annual etc. Plant Breeding / Re: Selecting orange endosperm flint corn. That Cateto seed was originally give to me by Josh Gochenour and was quite a few years old by the time it got to you, so I think it was faded a bit. Definitely carotenoid pigments fade/degrade over time, so that has something to do with it I think. Back when Josh and I were regularly speaking about corn, he told me that a lot of the high carotene selections in the USDA would look fairly pale if you received them, but they would express very high carotene when you grow them out. He felt it was just long storage fading the seed, and possibly the growing conditions at the PI station not being ideal for carotene expression? I know that seed sometimes sits around for many years between grow-outs. Humm... I want the colored pericarp and figure on anything but the very dark red I'll still be able to see different shades and select accordingly. I'm not saying its impossible reed, but selecting high carotene endosperm color through colored pericarp is going to really complicate your life. Even the lightest pink or bronze tint to the pericarp totally skews and masks the endosperm color to a huge degree. I am very busy selecting my flint for high carotene. There definitely is shading of color when you are working with a population that is highly variable and segregating for white,yellow,orange endosperm. But the differences can be surprisingly subtle except for the white kernels. That's the main reason I've been weeding all the pericarp color out of my flint population, because the tinted pericarp colors really interfere with visually selecting for orange/high carotene kernels on a mixed color ear. If I had my project to do over again, I would have started with a plain yellow flint instead of starting with the Cascade Series and Bronze Beauty. Both Cascade Ruby Gold and Bronze Beauty have shaded/tinted pericarp that is transparent enough to see the endosperm, but it changes the visible color, not unlike a tinted window. It makes it really hard to tell an orange kernel from a average yellow. This picture is not ideal, this is an F1 ear of Cargill North Temperate Cuzco X Oxbow Orange Flint Grex and the floury starch in the kernel centers is too prominent compared to a good flint, so its a little harder to see the endosperm color, but the pericarp is clear so you can see the range of segregation for yellow and white, and there are a few kernels that are clearly high carotene crosses. I think selecting for maysin will not be terribly difficult given the heavy worm pressure your corn is subjected to. For myself, I was interested in Zap Chico because of the maysin genetics, but also because it is considered a premium tortilla quality corn in Oaxaca (based on my reading). My earworm/armyworm pressure is very low, so my ability to visually select for worm resitance is compromised by not having enough natural selection pressure from the worms. It is good to know the genetics involved, at least the ones that have been studied, but selection of worm-free ears is probably going to take you all the way home. In terms of the other pericarp colors, only time will tell. Gilbert, you might consider trying some Cimatli potatoes from Cultivariable. They might be more adapted to such a dryland system than tuberosum. How do they become selfed and inbred if they are outbreeding? Diploid potatoes have a strong self incompatibility mechanism, but it is not functional in tetraploids for some reason involving the doubled genome. So it is easy for a pollen fertile tetraploid to produce a lot of self pollinated seeds since the pollen is released in immediate proximity to the stigma in Solanum flowers. I have never been particularly interested in landrace plant breeding for most crops. I also do not think that potatoes are particularly well suited to landrace techniques, at least under my conditions. It seems like the only way to do that effectively is to use diploids, given their combination of pollen fertility with self incompatibility. With pollen fertile tetraploids, I find that plants that produce huge crops of berries are almost certainly self pollinating to a huge extent. I do think I have relatively high levels of crossing in my potato plantings, since I see the bees working the flowers actively, and I know most of the stuff I grow is pollen fertile. This year I collected approximately 13 ounces of bulk TPS from my potatoes. Over 50% of that was from one variety that produced 7.5 ounces of seed (that I managed to harvest). I was very happy to collect so much seed, and I happily was able to sell some wholesale and donate a large amount to the Kenosha potato project. For my own TPS grow-outs though, I am more interested in the tiny batches of seed I collected from other potatoes with much more sparse fruiting. It seems much more likely to me that these indicate successfull crosses, and are likely to produce a variety of offspring to select from. I remember a few years ago on HG Joseph was advocating breeding for an "abundantly fruitfull" potato landrace, which would produce high yields of tubers and large amounts of seed. It isn't clear to me that that is a feasible goal, at least under North American conditions. I do think it is important to focus on male fertile lines as much as possible. For my own projects, I don't know if I will begin doing careful planned crosses though. It is very difficult for me to commit that kind of time to hand pollinating at that time of year. In general hand pollinating is not a breeding technique I'm particularly interested in, simply due to lack of time. What IS fairly easy for me to do is grow out large numbers of seedlings, and to evaluate them over a number of years. I've been really grateful to have access to Nathan's extra TPS crosses, as they have been very fun to grow out. One area I would like to explore more is to better understand the difference in behavior of TPS seedlings from the seedling year to the first and second tuber years. I would like to get much better at evaluating seedlings for their potential. I have found that the results from the seedling year don't necessarily translate to the tuber grown years, and I want to understand better what changes can be predicted. If that makes sense. My other concern with Zapalote Chico (Oxbow Farm shared some with me too), is that it seems more like a dent corn than flour. ZC kernels actually bear some resemblance to gourdseed corn, with a large amount of floury endosperm in the center, but also a pretty thick layer of flinty endosperm around the edges -- unlike a true flour corn. I wonder how difficult it will be to select that little bit of flinty-ness back out of your flour corn. It probably wouldn't hurt much for grinding, hominy, or ornamental purposes, but a little flint may negatively affect parching qualities. But...it might be worth it for the worm resistance. Mike, In my experience it is extremely easy to remove dent and flint characteristics from flour corn mixed populations by visually selecting them as long as you have pericarp that is clear enough to see the endosperm. With opaque pericarp colors you can still eliminate visibly "denty" phenotypes but getting rid of flinty endosperm is pretty hard unless you start hand pollinating and selfing, which is upping the labor intensiveness of the breeding work quite a bit. In my own white flour grex I have included Caribbean flints which were very flinty, as well as Tuxpeño which is a pretty classic dent, and Coroico/Pirincinco which had flinty/denty/and floury all mixed together. My procedure is to de-tassel for two years and then visually select for the visibly flouriest kernels in the F2 ears that have made the cut for other agronomic characters like standability, NLB resistance etc. The F2 selected seed is added to the grex and allowed to pollinate and be selected with the mass population. My personal approach has been to do everything I can to eliminate pericarp and aleurone colors from my populations so I can visually select endosperm character to select individual kernels within an individual ear. It really depends on your goal for the corn though. Pericarp and aleurone color is really useful for an ornamental corn like reed is building. For my own uses the colors don't add anything I need, and prevent me from selecting my corn the way I want to as well as interfering with nixtamalization. I ask because the flour corns are just so much more of a pain to grow than the flints. And especially in the midwest. They are more susceptible to stalk rots and insects. And have much more tendency to mold if rained upon after they start drying down. Much harder to store, too. There's a little moth that loves them that has a hard time doing much with a flint. Carol, in general this is true, but most of the serious issues with growing and drying down flour corn east of the Mississippi are eliminated if you start with the right material. In my experience, flour corns derived from the Southwestern/Great Plains flour corns are really hard to grow well out East. They have essentially zero tolerance for fungal pathogens at all. Especially ear and stalk rot, and Northern Leaf Blight. 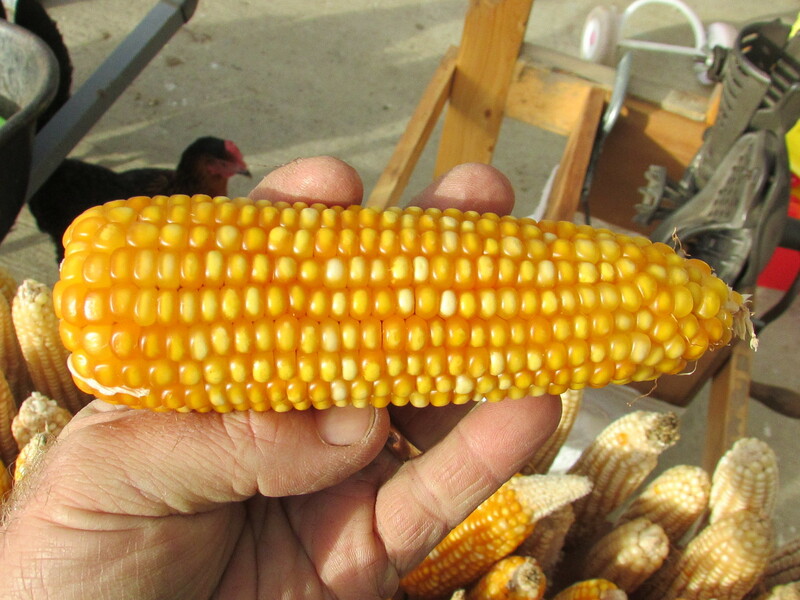 Lack of NLB tolerance is pretty characteristic of all Native American heirlooms from N. America in my experience, but corns like Painted Mtn, Hopi Pink, Parching Red Supai, etc are essentially 100% susceptible. If you use corns from the Eastern White Flour complex like Cherokee White, Miami White, or one of the many strains of Iroquois/6 Nations White, the results are very different. They are highly resistant to stalk rot and ear rot and usually have no trouble maturing dry grain in my fall weather conditions without significant mold. I've also found it really useful to include genetics from S. America and Central American corn, Coroico/Pirincinco is a flour corn from the Amazon, and has great mold resistant genetics to contribute, as well as near perfect field immunity to Northern Leaf Blight. Grain moth damage in storage is definitely a problem though, that much is true. We get cold enough in winter that I often put my buckets of shelled corn out on the porch for a few weeks to freeze. But they get recolonized since we have a resident house population of the moths. I find it worth it to grow flour corn because you get much different textures and can make different dishes with flour corn. I prefer flour corn for posole, and for things like arepas and flautas. It is easier to grind flour corn into a very fine grained masa than it is for flint, so the texture of the resulting tortilla or flauta is more delicate. You also cannot make atole with flint corn very well, at least I haven't been able to.